Everyday for some time now I’ve been successful in getting out in nature – usually by the river or at the beach. In case of rainy days, my front porch is the perfect place. But today before a doctor’s appointment I visited Shem Creek Park in Mt. Pleasant, SC. I’d been to this park before but had never walked out on the extensive boardwalk. And even though it was a bit hot today, the walk was beautiful. The marsh was a bright green. I saw oyster beds, fiddler crabs and beautiful egrets. Once I was down by the water, I had the pleasure of meeting a family from Pittsburgh that was trying to catch crabs and while I was there they had two very successful attempts. I was also able to see some of the many shrimp boats lining the docks along the waterway. I watched an instructor teach young kids about canoeing. 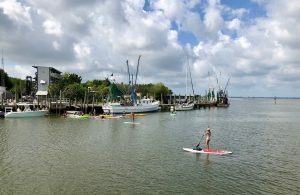 I also observed two women on paddleboards making their way out into the Charleston Harbor near Fort Sumter. Now I want to come back during the evening. Watch the sunset at the very end of the walkway where I believe there is a cover area to sit and watch the harbor and the Atlantic Ocean beyond. Plus I think it would be the perfect place for some wonderful Lowcountry pictures. But before you start your way toward the water, you are greeted by “Pete, the Plastic Pelican”. 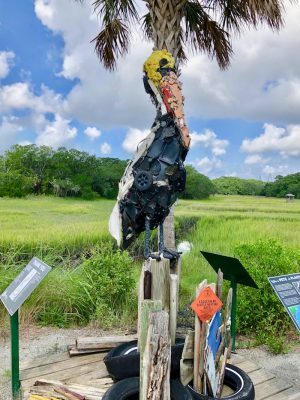 Pete was made using the plastic trash that was found during a 2011 Beach Sweep in the Charleston Area. It is a huge reminder of how we pollute the surrounded beaches and ocean. When I get to experience beautiful waterfront parks like I did today, I hate that we have such a trash/debris problem in out waterways. Just remember: put trash in its proper place, recycle items and reduce single use plastics. *This information was obtained from the plaque in front of “Pete, The Plastic Pelican”.